If a construction project involves a historic building, you may need the State Historic Preservation Officer to review the project. Learn about our work across the state and how we can be of service to you and your constituents. See finanicial information for the Wisconsin Historical Society. Learn about the procedures for handling publicly-owned or abandoned burial sites. Explore resources for state and local government record keepers and learn about our government publications collection. 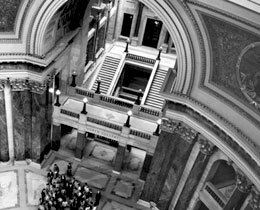 The Wisconsin Historical Society assists government agencies with records retention and preserving historic properties and sites. Search to find out how we can help.